Leading a large and diverse school like Cumberland High School draws on a number of skills and, frankly, forces me to use muscles I did not even know I had. 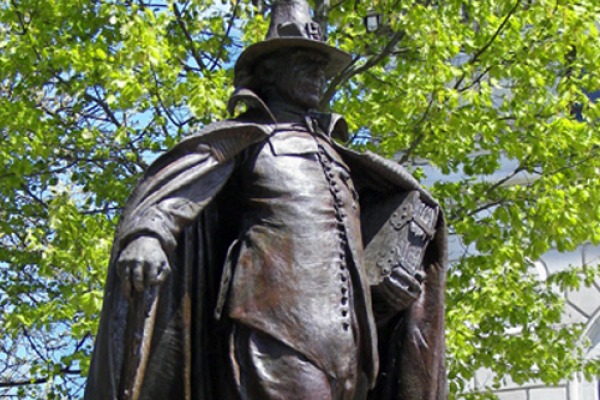 As a proud Rhode Islander, I can easily find inspiration for my leadership in the example of our state’s founder. Speaking truth to power. Our state was born from a clash between Williams and the Massachusetts Bay Colony. Williams did not withhold his discontent with Colony policies or his vision for a better way. That forthrightness made him dangerous to those in power but ultimately advanced the cause of democracy and tolerance. Amplifying our voice to decision makers is not the dangerous prospect it once was, but remains just as crucial today as it was 400 years ago. During my career--and especially during the year I was honored to serve as the National Principal of the Year—regular contact with state and federal policymakers to provide a reality check and advocate for a better way has been an essential element of my work. Openness and transparency. Democracy is a messy business. It requires openness to new ideas and a safe platform for people to share them without fear of punishment. And it requires that everyone see how and why decisions are made. 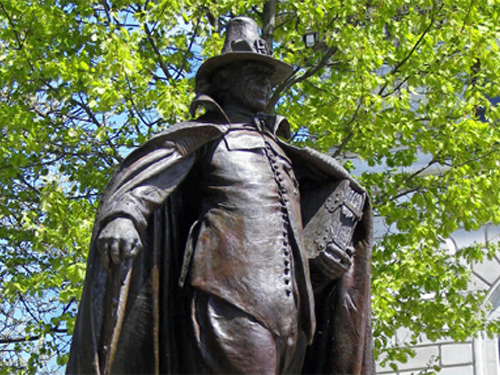 I have read that Roger Williams could be disagreeable—as leaders can occasionally be—yet at no point did he allow his vehement disagreement with any person or group of people result in their banishment from the colony. And he deemed their participation essential to the function of a fully transparent government. These lessons are essential to any change initiative at Cumberland High School, whether as small as a policy update or as large as the introduction of schoolwide standards-based grading. Real improvement only happens if everyone feels engaged, has the opportunity to dissent, and understands how and why decisions are made. Relationships. Leadership is about people far more than policies. Those you lead will trust you only if you take the time to genuinely know them. By living with the Narragansett and Wampanoag, Williams earned their trust, which allowed him to peacefully purchase land from them rather than having to violently seize it. So great was the trust that he often mediated conflicts between the tribes. School leaders know this lesson well, and we strive to create environments where all students are known and respected for who they are because, as Williams’ legacy reminds us, there is no great progress without deep relationships. As I travel the country, the contrast in size between the state I am visiting and Little Rhody is a regular source of fascination. But our history and the legacy of our founder looms huge for all to see. I am proud to learn from that legacy. And prouder still to have a share in it. Alan Tenreiro comes from a family of educators. His grandfather was a high school assistant principal. His mother was a teacher. His sister is a teacher. Upon graduating from high school, he enrolled at Rhode Island College and began chasing his dream. He earned a bachelor’s degree in education and a master’s degree in educational administration, both from Rhode Island College. After that he earned a Certificate of Advanced Graduate Studies from Northeastern University. He spent seven years teaching social studies at his alma mater, Mount St. Charles Academy. Then, in 2006, he was named assistant principal at Smithfield High School. In 2012, He was named principal at Cumberland High School. He served as a member the Pawtucket School Committee from 2003-2007 and 2010-2014 and was named Chair of the committee five times by his peers. Alan co-founded and co-moderates #Edchatri, a leading educational Twitter chat in the state and country. In 2016, he was named National Principal of the Year by the National Association of School Principals - the first ever from Rhode Island.